I've been asked to do this quite a few times - And here it is - All the bow tie styles that I offer in one easy to understand photo. Each size and style has something special about it. Obviously, your bow tie can look bigger or smaller depending on how you like to tie it also. People have asked me to do sizes that aren't on here before - and it's generally not a problem for me. So there you have it. Now I have to go and try to figure out how to post this picture on my store. 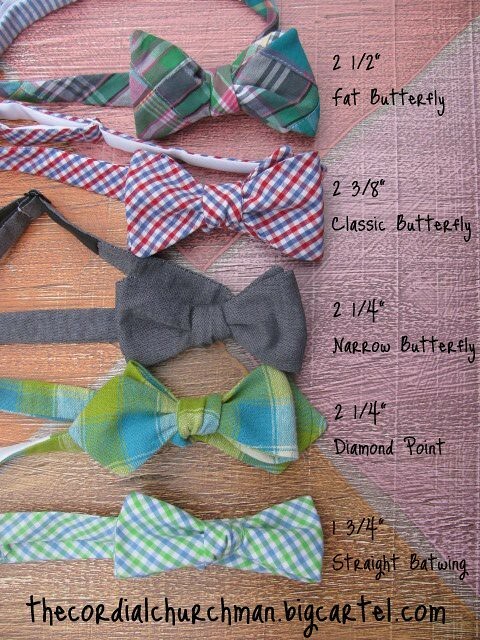 Great to see you offer the diamond point-so many bow tie makers are lazy and stick with the butterfly.